Have you got to erect a scaffold tower over a doorway that’s in use? Working over a fire exit? In an office that is full of desks? This system allows you to erect scaffold tower without the braces that normally have to be used in the first 2m of the tower. This means that it leaves the way free for pedestrians. It also proves useful in office environments where lights and ceilings have to be cleaned and serviced, but the desks and other furniture makes it difficult to do this safely. This is a very simple scaffold tower addition to use. Each High clearance frame has 4 self locking clasps that clip onto the extenal end frames of the tower. Price £30 per week (a pair). Please note, this scaffold tower addition needs to be used in conjunction with a scaffold tower that is 2.2m (platform height) or above. Just because urgent maintenance work needs to be done, it does not necessarily mean that business premises and commercial enterprises have to shut up shop while it is taking place. With the help of a high clearance scaffold frames, you can safely carry out maintenance work above active shop doorways, entrances and even over desks in an office where it is necessary to work on ceilings or to clean and service lights overhead. High clearance scaffold frames, which can be added to a standard scaffold tower, are erected without braces so that there is 2m clear for people to use accesses and areas while you work safely above their heads. It is so secure that you can even use the high clearance scaffold frames in public places with pedestrians coming and going underneath. The smart equipment has four self-locking clasps that clip on to the external end frames of the tower making the structure extra secure and offering you peace of mind while you work. The frames are so easy to use as an addition to the standard fittings and they can be fitted in just minutes. Standard scaffold towers are also effortless when it comes to putting them together. Within an hour you can have a safe, comfortable platform to work from, whether you are working indoors or outside making it a safe working environment for you, your fellow workers and pedestrians gaining access underneath the structure. 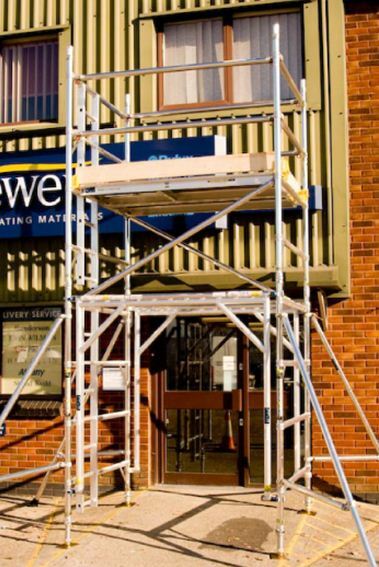 The standard scaffold tower is simple to build using a clever system of coloured braces which lock into place so you know that it is put together safely and correctly and there are no errors. Putting together a scaffold tower is an effortless task; you don’t need any special tools or experience. A first-time user should easily be able to erect a scaffold tower within an hour.